Shawn Perry, founder, publisher and editor-in-chief of VintageRock.com, has put together an expansive, Conversations With The Masters: The VintageRock.com Interviews book you just need to get your hands on. Vintagerock.com started on June 1, 1997, in sync with the 30th Anniversary of the Beatles’ Sgt. Pepper’s Lonely Hearts Club Band, and the rest is history. In his years at VintageRock.com Mr. Perry has not only reviewed tons upon tons of live shows and releases, he also has had the privilege of interviewing some of the best in the business. In Conversations With The Masters: The VintageRock.com Interviews we get some of the very best of Shawn Perry’s interviews from the site. I had the chance to speak to Shawn and get the skinny on his gem-of-a-new-book. Out of all the interviews you have conducted and posted on VintageRock.com over the years, what criteria did you use to pick the ones that made this book? I went with my first instinct and initially chose the ones I felt went right, because sometimes they don’t (he laughs). Obviously, I was also very biased in that I went with the biggest and brightest people in my world. I know most about them, was able to conduct reasonably intelligent interviews with them, so they came out the best. Is there any one thing-or a few things-that you find all these artists have in common in relation to their ‘art’? They’re all highly accomplished musicians, really the cream of the crop in many circles. Rick Wakeman and Keith Emerson are arguably two of the greatest keyboardists in the history of rock, so the bar is set pretty high. I think the guitar heroes I mentioned, the legends, Ian Anderson, Ian Gillan and Glenn Hughes from Deep Purple, Mark Stein and Carmine Appice from Vanilla Fudge, Mick Jones from Foreigner, Gregg Rolie from Santana and Journey — this caliber of player is a common thread in the book. Do you dare pick a favorite or favorites? And why? Oh yeah, I have favorites I included. Wakeman and Emerson are favorites. Justin Hayward is another one I really liked, just because he was genuinely enthusiastic when we talked. I called him when he was at home in Monaco, so maybe that had something to do with it. The Ronnie Montrose interview is the only interview in the book I did in person and on camera. That one is kind of special because Ronnie and I hung out a bit afterwards, and then six months later, he was gone. What was the most surprised you ever were during an interview? I’m always surprised they even let me talk to these people (he laughs). Some of them were in posters on my wall when I was growing up. Off the top of my head, I was surprised to hear that Tommy Chong would have smoked a joint with me if I had asked him when we met. The problem is he told me this in an interview we did over the phone after I met him. We agreed that he’s on my bucket list and Paul McCartney is on his, as far as people we want to smoke joints with (laughs). I’m saving that interview for the next book. If you could interview someone you haven’t, alive or dead, who would make your top list? There’s loads of them, some deceased, but many still alive and kicking. John Lennon, George Harrison and Jerry Garcia are three I would have loved to have interviewed. Jimmy Page, Paul McCartney and Mick Jagger are three still around I’d be up for. Maybe someday. The clock is ticking, you know. That’s definitely one of the downsides of coming to bat this late in the game, if you know what I mean. It’s funny though, because for many years, the guys in ELP were on my radar, and I ended up interviewing and meeting all three. Of course, Keith Emerson and Greg Lake both passed this year, so I’m grateful I got the opportunity to do that. What’s coming in the near future for this project and for VintageRock.com in general? Right now, we have hard copies of the book available to buy with plans for an e-book. And like I said, I’m planning a second volume of 25 more interviews, some of which have never been published. We’re also thinking about a concert review book with reviews alongside live photos from Ron Lyon, Kimberly Annette, Maria Huizinga, and Junkman. And maybe a CD/DVD review book with reviews from me, Merryl Lentz and other contributors. There’s just so much content on the site, and some of it needs to be reintroduced in a new light. I’d like the site to diversify beyond just what it is, that’s for sure. It’s hard to say how or where because the Internet is always evolving, and a lot of what we cover on Vintage Rock changes as well. We always have to adjust to stay relevant. It’s been 20 years and anything can happen. As long as it’s good and timeless, it’s vintage and we’ll cover it. Twenty years from now, it could be Kanye West and Beyoncé. That will be a hard pill to swallow, so we’ll see how that plays out. At that point, I’ll be too old to care (laughs). 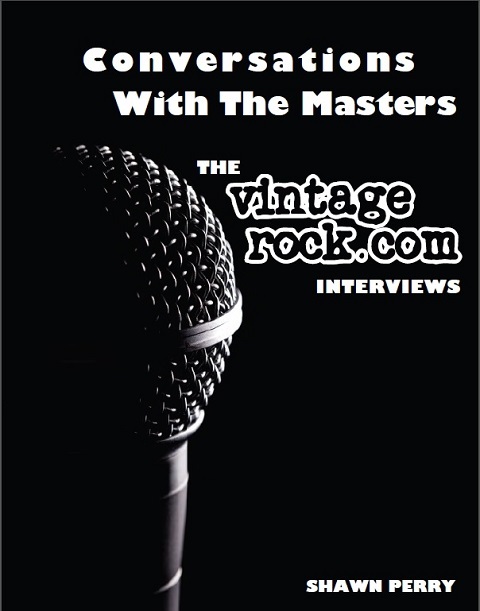 Shawn Perry’s Conversations With The Masters: The VintageRock.com Interviews can be ordered here.